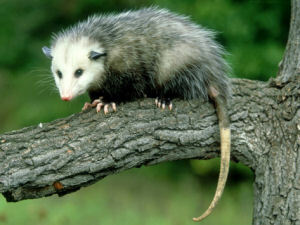 First up - this isn't a possum. That's an opossum from the northern hemisphere. This is a brushtail possum and they are originally from Australia. if you come face to face with one they're probably more likely to give you this face - they are fierce! why do we use possum fur in our yarn and how can we claim to be supporting animal welfare? ​Brushtail possums are actually a serious pest in New Zealand and major threat to our environment and endangered bird life. 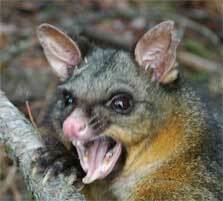 “The brushtail possum is an introduced species released in NZ in 1837 to establish a fur industry. As demand for fur fell and its value dropped to uneconomic levels the numbers of possums dramatically increased. 21,300 tonnes of vegetation nightly, decimating New Zealand’s native bush and birdlife. many native trees, plants and birdlife, including the kiwi, are under threat of extinction. products worldwide and getting people who care about the environment to purchase these products. I understand some people have reservations about animals being culled. I wouldn’t be keen on yarn that had come from an animal killed just for it’s fur. The big difference for me with regard to possum yarn is that these animals would be culled even if their fur was horrible. they are a serious threat to our ecosystem. The damage to native forests can be seen all too clearly in many areas. such as insects and berries. They also disturb nesting birds, eat their eggs and chicks. boxing up all however many million of them and returning them to Australia then I’d be all for it. it’s actually better to put the fur to good use rather than just destroying it. to understandthe level of destruction that possums cause here in NZ. so if you have further questions, please feel free to email me.